Many people go through life with crowded or gapped teeth, thinking that straightening their smile will require discomfort and hassle. But living with a less-than-confident smile can have a negative effect on your overall oral health and your self-esteem. If you are a teen or adult who is seeking a beautiful smile, without the pain of metal braces, Hughes Dental Group provides Invisalign® in Campbell, CA. Teeth that are well-aligned are attractive, but they’re also usually healthier. If your teeth are crowded, this gives harmful bacteria an opportunity to hide in difficult-to-floss crevices between tightly-misaligned teeth. If you are unable to effectively clean between teeth, it is more likely that you will experience damage from decay-causing plaque and debris. With teeth that are positioned in a straight line, you can brush and floss most effectively to protect your oral health and the future of your healthy smile. Thankfully, for patients with crowded teeth, gapped teeth, or bite issues, getting Invisalign® clear braces in Campbell from Hughes Dental Group provides a comfortable alternative to traditional orthodontic treatment. Metal braces are difficult – they are highly-visible, hard to brush around, and contain brackets and wires that can injure the sensitive tissue on the inside of your mouth. 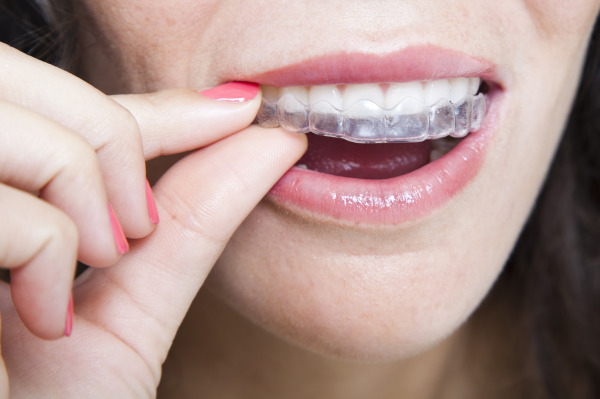 • Nearly Invisible – The aligner trays are made from a clear, sleek thermoplastic material that is smooth for patient comfort and is nearly impossible to detect when worn. • Customized for your Smile – Your Invisalign® treatment is specially created to fit securely around your smile at every phase of treatment, which helps it remain invisible during wear. • Convenient – You can remove your aligner trays for any big event or photo opportunity where you don’t want the slightest hint of a dental appliance to keep you from feeling confident. You can also take your trays out to brush your teeth – there is no need for special picks or brushes to clean around brackets or wires. • Effective – Invisalign® is able to correct the same array of oral health issues that regular metal braces can address. • Cost-Effective – Many patients ask, “How Much Does Invisalign® Cost?” The good news is that the average cost of Invisalign® treatment is the same as the average national cost for care with regular braces. For in-depth information on insurance coverage and treatment plan costs, be sure to discuss your care with your dental insurance provider and the Invisalign® dentists at our Campbell dental office. Hughes Dental Group’s team of experienced dentists can show you how easily your smile can be transformed with clear braces. For more information on Invisalign® in Campbell, contact our dental office today!